Explore 31 countries across Europe at your own pace with the Eurail Global Pass! This pass really helped us so much and much more cheaper then usual price. we have saved so much of money and we travelled on First class. 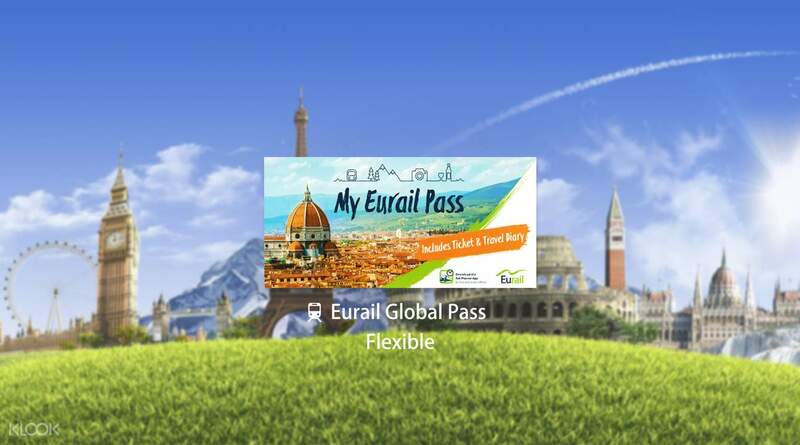 Freely explore Europe at your own pace and convenience with the Eurail Global Pass (Flexible)! Offering unlimited rides in 31 countries all over Europe - including France, Germany, Italy, and Switzerland - you'll be able to hop on and off trains to get to your destination, without having to purchase tickets individually at each station! Simply make a booking by selecting your date of departure to Europe, preferred Rail Pass, and validity period, and you're good to go. Enjoy free delivery of your Eurail Pass, as well as further discounts on other means of transportation, attraction tickets, hotels, and so much more! Explore 31 different countries in Europe hassle-free with the Eurail Global Pass (Flexible)! receive this very fast.. deliver to your front door home just few days after i place order on this.. very good service buy from Klook.. amazing.. throughout my journey i can access smoothly and convinent for me to take train across the country with this eurrail pass.. i definitely will buy again when i visit europe.. receive this very fast.. deliver to your front door home just few days after i place order on this.. very good service buy from Klook.. amazing.. throughout my journey i can access smoothly and convinent for me to take train across the country with this eurrail pass.. i definitely will buy again when i visit europe..
very nice trip and we met the strike in paris but nothing's needed to worry. easy to use and very convenient for transportation from one country to another one. very nice trip and we met the strike in paris but nothing's needed to worry. easy to use and very convenient for transportation from one country to another one. This pass really helped us so much and much more cheaper then usual price. we have saved so much of money and we travelled on First class. This pass really helped us so much and much more cheaper then usual price. we have saved so much of money and we travelled on First class. This pass gave us the ultimate flexibility with comfort especially on our Swiss rail journey. Totally enjoyed new found freedom with whimsical visits and last minute change of trips without having to worry about cancellation and penalty. Maybe next time will just get Swiss pass so the Interlaken to Jungraujoch trip will be less costly. This pass gave us the ultimate flexibility with comfort especially on our Swiss rail journey. Totally enjoyed new found freedom with whimsical visits and last minute change of trips without having to worry about cancellation and penalty. Maybe next time will just get Swiss pass so the Interlaken to Jungraujoch trip will be less costly. On the first travel day from Munich to Milan.. Reserved a 4-bed Couchette for €44 but was in one that can fit 6 (€33 to reserve). Might try the latter in my next travel day! On the first travel day from Munich to Milan.. Reserved a 4-bed Couchette for €44 but was in one that can fit 6 (€33 to reserve). Might try the latter in my next travel day! We have received an excellent service from Klook to order our Eurail passes. We have a great time traveling with Eurail. Easy to use, on time, convenient and comfortable as well as friendly staff. To make it more easier for travelers with luggages like us is more space for luggages and ram (less stairs). We have received an excellent service from Klook to order our Eurail passes. We have a great time traveling with Eurail. Easy to use, on time, convenient and comfortable as well as friendly staff. To make it more easier for travelers with luggages like us is more space for luggages and ram (less stairs). Great and cost effective way to go around europe. Recommended. Great and cost effective way to go around europe. Recommended. Easy to use when travelling around Europe. Do make sure to plan well and purchase early as the price will increase! Easy to use when travelling around Europe. Do make sure to plan well and purchase early as the price will increase!